I don't know about you but I seriously hate when my kids get a Nerf or BuzzBee Gun because they run out of darts in a heartbeat! Either they lose them in the yard, or the dogs/cats/siblings get them. 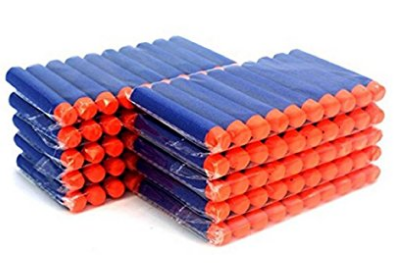 To replace darts you can end up paying almost $1 a dart which adds up fast if they keep going missing! Check out this great offer on darts and stock up for Christmas so it can be a all out war and not break the bank.